Bridget Nail Polish Review by PP Reviewer + Blogger | Glitter, Fork & Paper. Bridget nail polish is part of the Opulence Shades range. From this collection, I already own a few polishes. Grace to which I have reviewed. Monroe, O’Hara and Holo On Top which I will definitely talk to you about soon because I love them more than words can explain. So what is an Opulence Shade? Well, it is a lavish, luxurious, rich and sumptuous nail polish colour. 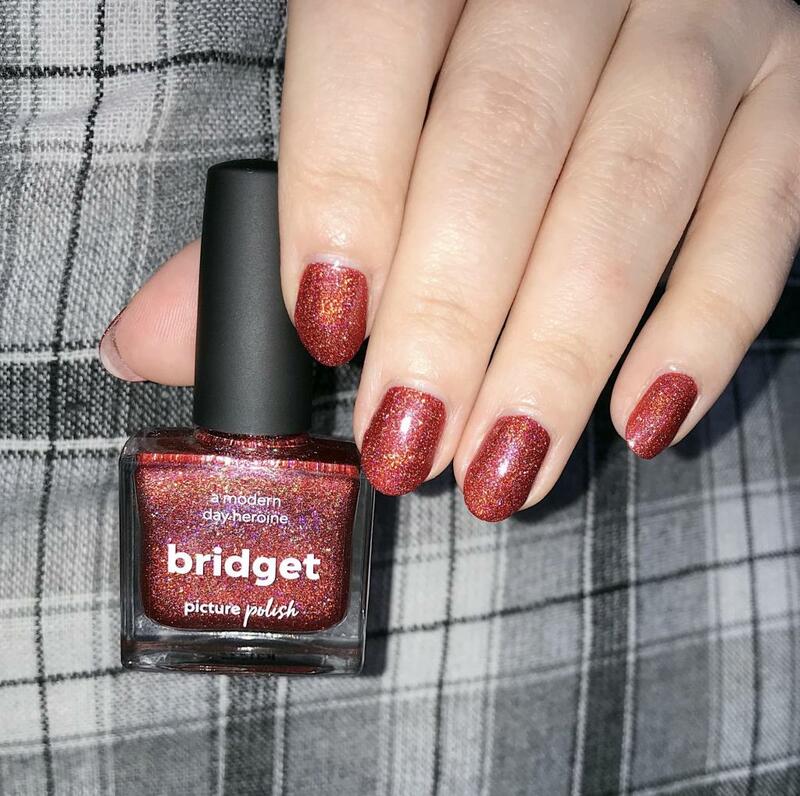 Shade wise, Bridget is described by Picture Polish as a deep red holographic nail polish and this is exactly what it is. Bridget’s holos are mainly gold and red but there are also a few raspberry ones which give it even more depth. It corresponds 100% to the description of an Opulence Shade. It is absolutely unique and so sooo beautiful! I am a very picky red nails addict so I can tell you that I was expecting a lot from Bridget and honestly, I fell in love with it hard. Bridget belongs to a different range of polishes but the brush is the same as any other Picture Polish lacquer. It is of medium length, quite flat, slightly wider towards the end of the ‘hair’ and the latter are cut straight. Like I always say, Picture Polish’s brush is not a ride-or-die for me but I have no issue at all applying my polishes with it so I like it. As far as the way it applies, Bridget is alike all the Picture Polish lacquers I tried so far: easy and pleasant to apply. The texture plays an important role in the way Bridget applies. When I apply it and when I touch it, the latter feels like a cream polish whereas it is actually saturated with holos. It is an amazing texture! The opacity of Bridget Nail Polish is also a very positive aspect because even though I applied three thin coats as usual, two are actually more than enough to get the exact same result as you see on the pictures. Bridget is similar to its Picture Polish brothers and sisters as it dries very quickly on the nails but not so quickly that I would not have time to go over a brush stroke to perfect it if needed for instance, so no stress at all while painting my nails with it. Bridget is not covered by any top coat and its natural shine is insane! Without any top coat, it shines like a gelled-texture polish and its holos and their reflects are breathtaking. I am blown away by its beauty. Once again, Bridget definitely corresponds to the definition of an Opulence Shade. Due to the awful weather that day, I had no choice but to take pictures with the flash on but I can tell you that Bridget Nail Polish looks just the same under natural lighting. I applied a top coat of afterwards and Bridget remained the same. It is stunning by nature. Bridget has the same holding power as its brothers and sisters. I indeed noted that it held perfectly on my nails for a good 5 days. From the 6th day, it slowly started fading away towards the free end of my nails but in a very discreet way. This is what I call a perfect holding power. Red can be intimidating when it comes to polishes as I personally sadly experienced some staining with red polishes of different brands. Well, my nails are safe with Bridget as it is not one of those. As usual, I used my acetone-free nail polish remover to take it off and it disappeared without staining my nails and without leaving any holo. I am pretty happy with that!